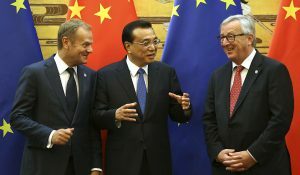 The Paris Agreement calls for a “balance between anthropogenic emissions by sources and removals by sinks of greenhouse gases in the second half of the century. This emphasis on “a balance” – or what is also referred to as “net-zero emissions” in the case of the energy system – is a critical development. It recognizes that surface temperature warming is directly related to the cumulative total of carbon dioxide (CO2) emitted to the atmosphere. As climate change is a key issue to deal with and it is a cumulative problem, there is a need for the energy system to get to net-zero emissions to bring a halt to the rising level of carbon dioxide in the atmosphere. However, the time period society has to achieve this is less than it will take to find and/or scale up alternatives for all energy services, goods and products for 7.5 billion people that are currently provided by fossil fuels. In other words, society needs to fill an important gap between when we need to get to net-zero emissions and when we can actually get to zero emissions. The former is around 2070 to meet the goal of the Paris Agreement, whereas the latter may not be until sometime in the 22nd century. Increasing the carbon uptake of the biosphere through land management practices such as reforestation. The production of various products, such as plastics, from fossil fuels or biomass. 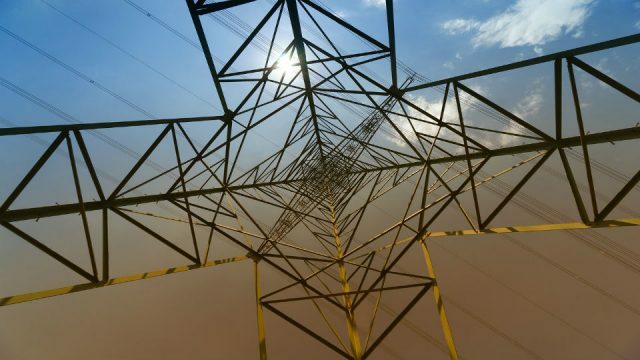 All of the above feature in the new Shell scenario, Sky – but sharing the understanding of how they fit into the energy system and what can be achieved was one of the communication challenges behind the Sky scenario publication that was recently released. 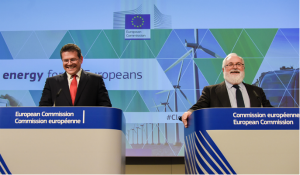 Sky reaches net-zero emissions in the energy system by 2070, resulting in stabilisation of atmospheric CO2 and a limit on warming of around 1.75°C in 2100, or well below 2°C as called for by the Paris Agreement. 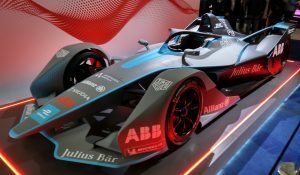 By the time 2070 is reached, the global power generation system is largely renewables and nuclear, but fossil fuel use in certain modes of transport and heavy industry remains significant, albeit declining. The remaining fossil fuel emissions must be dealt with to achieve the goal of net-zero emissions. To help scenario readers understand the change and see how emissions are managed, we developed a chart that illustrated the carbon flows in Sky as time went by. The sequence starts in 2020 and includes visual elements to help the reader understand what is going on. 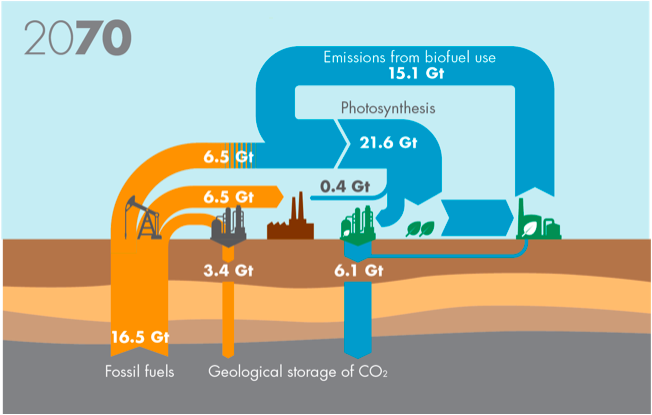 In the 2020 illustration above, fossil fuel production results in 35.2 Gt of CO2 emissions, from a potential of 37.8 Gt based on actual extraction. The materials produced include bitumen for roads and petrochemicals that don’t end up as energy products (e.g. combustion of plastic waste). 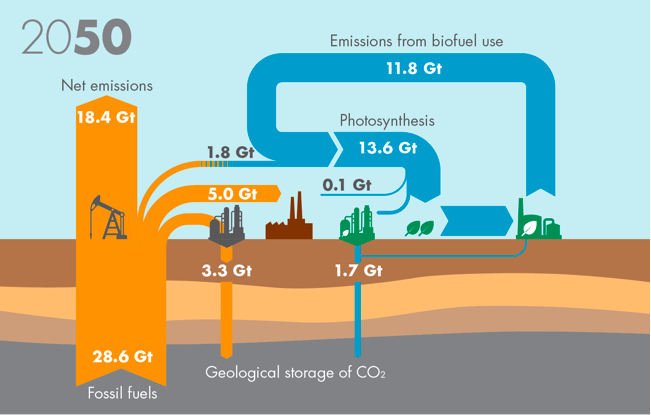 The biofuel energy system is also shown, which results in a loop as CO2 is absorbed by plants, then released again as the biofuel is manufactured and finally used for energy. At this stage, there is no real interaction between the systems. By 2050, the scene is very different. CCS has emerged at scale, both directly in fossil fuel applications such as industrial facilities using natural gas in furnaces and indirectly in the bio-energy system, where geologically stored carbon amounts to permanent removal of CO2 from the atmosphere. 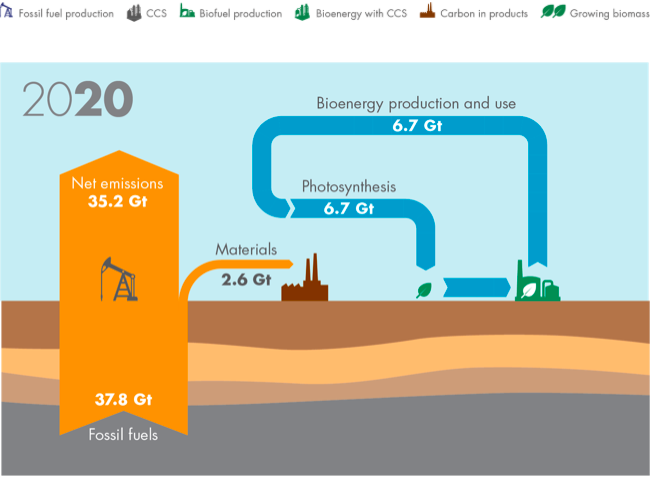 By 2050, BECCS (bioenergy with CCS) has also emerged at scale – this is the use of biomass for energy service provision, although principally for the generation of electricity, but linked with CCS. BECCS is illustrated in the diagram below and is a technology that exists in parts today but hardly as a whole. For example, biomass is used to make ethanol (corn and sugarcane) at large scale in both the USA and Brazil and is a major energy source (woodchips) for the power generation sector in Sweden. CCS also functions at some forty sites around the world, but the combination of bioenergy with CCS is very limited. One such example is the Archer Daniels Midland ethanol plant in Illinois, USA which stores one million tonnes per year of CO2. As this CO2 is from the ethanol process itself, it is, in effect, drawdown of CO2 from the atmosphere. 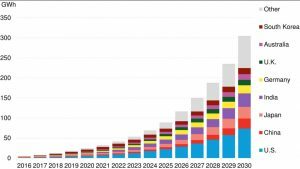 By 2070 the energy system has reached net-zero emissions, primarily through a scale-up of the bioenergy with CCS sector when compared with 2050. Finally, by 2100, the energy system is net-negative, drawing 6.4 Gt of CO2 per year from the atmosphere. 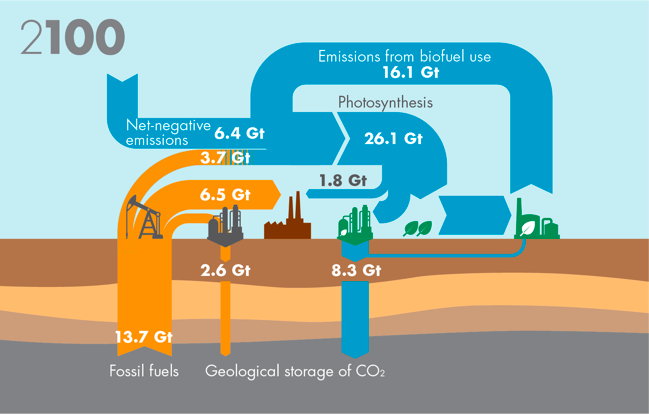 Fossil fuel use has declined further to 13.7 Gt equivalent of CO2, but this is all captured through one of the mechanisms discussed above. As BECCS does not exist at scale today, there are always questions about this pathway forward. However, bioenergy does exist at scale and CCS has been demonstrated many times at scale in early projects, so the combination of the two is entirely plausible. A competing future technology for drawdown of CO2 from the atmosphere is direct air capture linked with CCS (DACCS), but this doesn’t exist today other than at pilot plant size. Experience has shown that the time taken for energy and energy related technologies to move from pilot plant to meaningful commercial scale (i.e. >1% of system size, so in the case of DACCS, >200 big installations around the world) is measured in decades rather than years. For this reason, the drawdown pathway selected in Sky utilized BECCS rather than DACCS, but the latter should not be ruled out from future consideration. David Hone is Chief Climate Change Advisor at Shell. 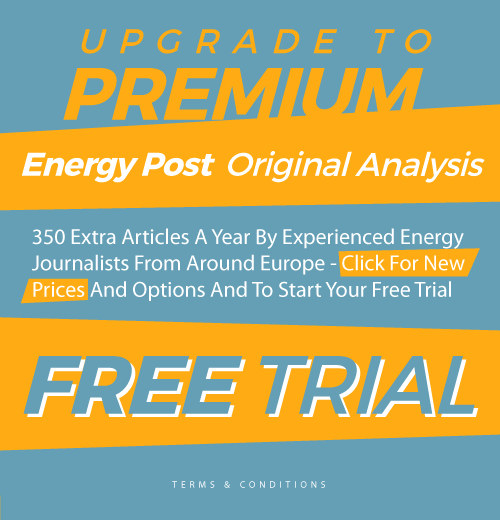 This article was first published on David Hone’s Shell Climate Change blog and is republished here with permission. 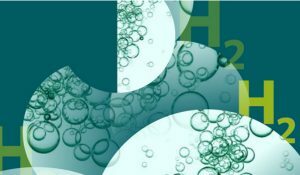 Taking the chemical industry & its use of natural gas as a feedstock (steam reforming to get H2) this could be replaced by electrolysis (indeed that is what was done in the past – before steam reforming came along). Outwardly, the 80 year time frame seems OK – but – does industry really change so slowly & given the impact that climate change is having (Gulf stream flow rates are down 15% 1990 to now) perhaps it is time to accelerate things rather than the “steady as she goes” views put forward in the article.